In this top-selling book, psychologist David Lester, recognized worldwide as a leading authority on death—both in the fields of suicide and homicide—offers a reliable psychological and sociological analysis of this most frightening yet fascinating criminal. He provides a much-needed assessment of whether or not there is a dependable and useable psychological profile of serial killers. 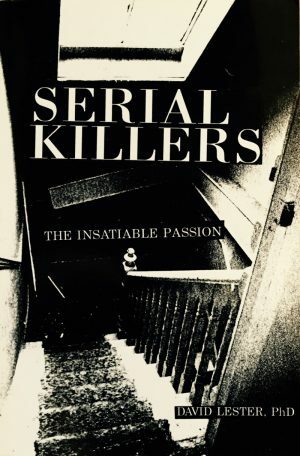 Separating the facts from the myths by combining documented case histories of notable serial killers with behavioral research, Serial Killers: The Insatiable Passion has been welcomed and applauded as an important addition to the literature on serial killers by criminologists, psychologists, sociologists, law enforcement and true crime buffs alike. It has become a staple of every serious true crime book collectors library. British by birth and educated at Cambridge University and Brandeis University, David Lester, PhD, is currently Professor of Psychology at The Richard Stockton College of New Jersey. He has devoted most of his distinguished career to the study of suicide and murder. Recognized worldwide as a leading authority on these subjects, he has written over 2500 articles and over 65 books including several Charles Press titles (Making Sense of Suicide: An In-Depth Look at Why People Kill Themselves; Suicide Behind Bars: Prediction and Prevention; Questions & Answers About Murder; Questions and Answers About Suicide; Emile Durkheim: Le Suicide 100 Years Later; Current Concepts of Suicide; The Cruelest Death: The Enigma of Adolescent Suicide; and Now I Lay Me Down: Suicide in the Elderly). The cover photograph shows the narrow stairwell that led up to the apartment of British serial killer, Dennis Nilsen—a stairwell that indirectly led to his capture. When Nilsen realized that he could not carry his victims' corpses down the stairs to his apartment without being seen, he hacked the dead bodies into small pieces and flushed them down the toilet. The smell from the blocked sewer pipes caused neighbors to call a plumber and the plumber, upon discovering decayed flesh in the pipes, promptly contacted the police. Nilsen was later arrested. "This very exciting book explores the known facts and proposed theories for serial murder and presents multiple case studies of serial murder. The purpose is to present a comprehensive look at the psychological and sociological aspects of the perpetrators of serial murder. This is a very important and timely contribution and the book meets its objectives well. The targeted audience is that of law enforcement and psychology. I recommend it as a text for forensic psychiatry fellows and others who are specializing in the study of murderous behavior. Additionally, I recommend it to attorneys who either represent or prosecute those accused of serial murder. It is also an excellent book for healthcare practitioners and students dealing with serial murder. The author does a service to the readers by bringing together into one volume a review of current theories regarding serial killing as well as reviewing what we actually know. Another noteworthy achievement is the lack of sensationalist tone so prevalent in the literature on the topic. I recommend it to those who work with serial killers whether in jails or prisons, to courts, to those working on apprehending serial murderers, and to mental health professionals studying to provide mental health services to serial murderers."